It is tough to argue that the Windows Phone 7 Marketplace doesn't still have a ways to go before it can be considered on par with the Android and iPhone equivalents. However, the growth of the marketplace is quickly providing users with a wealth of apps that seek to extend and improve on the feature set of the operating system. Furthermore, it seems that developers on average are pricing their apps at a discount to those on Android. 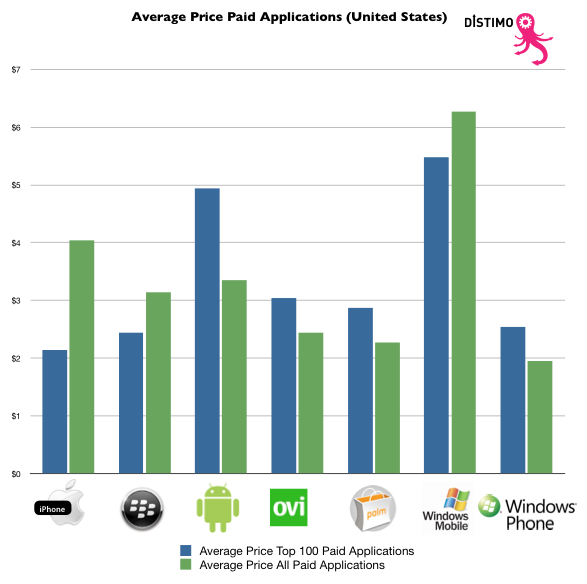 According to analytics firm Distimo, Windows Phone 7 Marketplace apps sell for an average of just $1.95. In fact, that report shows that there are zero apps that sell for greater than 9.99. Hit the link for the full breakdown and analysis. I am not surprised: In order to lure developers MS removed from WP7 even the most basic apps like Solitaire, Stock quotes, Weather etc. I do not remember for sure about Windows 1 and 2 but 3 and all the following releases had Solitaire. And I have heard there are way too many $0.99 'single use' items in the WP7, such as 'convert Euros to Dollars' ... whereas Apple mandates combined functionality in those cases. One thing for sure: Android is very much overpriced. There are also no high-priced navigation apps yet. This will surely push the average price up. Also, take a look at 148Apps, a site that tracks the iTunes App Store ... there are literally thousands of apps >$100 ... in fact there are likely more apps >$50 on iTunes than there are on the WP7 store! Good catch. I'll make the correction asap. Last edited by Adan Galvan; 11-29-2010 at 10:17 PM..
And? The discussion is about price paid, implying folks actually bought things. I could put a million dollar app on any platform store and drive that average up, if you don't consider sales. Please show me where in the data it is weighted statistically according to sales volume and a reference to the valid algorithm used. The author took an average of sales prices. There are no >$10 apps on the WP7 store, so the average is inherently lower compared to stores having higher priced items. Basic math. I mean, think of it - remember paying $30 for games like Call of Duty for the Pocket PC? I had a blast with that on my Axim! Or $20+ for Broken Sword or Ultima Underworld or so many others. Also, not every higher priced app is like the 'I am rich' $1000 do nothing app. The top priced one actually controls video surveillance cameras and has sold more than a few copies, and there are tons of REAL apps in the ~$100 or so area. Well, guess you're right. The title of the graph, "Average Price Paid" certainly implies sales to me. Sort of like average SRP of cars vs average price paid is significantly different. Does seem to sort of include the concept of purchase, considering that it compares the top 100 apps. "the app store with claim to the lowest average price among the top 100 paid applications". Wouldn't guess you would be in the top 100, less'n somebody was buy'n it.